Lee is unable to use ninjutsu or genjutsu. 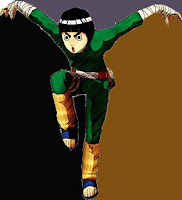 As a result, Lee's dream is to become a respected ninja by using only taijutsu. 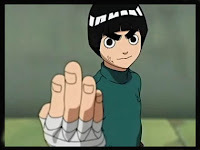 Through Guy's mentorship, Lee has become very proficient with taijutsu, mastering the Strong Fist style of combat and being able to open the first five of the eight chakra gates. He constantly wears ankle weights, and when they are removed his speed is drastically increased. Because many of the techniques he has learned can pose a great threat to himself and others, Lee is only permitted to use them to protect something or someone dear to him. While Lee's training has made him a formidable opponent, he is a natural-born user of the Drunken Fist. Should he drink as little as one drop of alcohol, he becomes an unpredictable source of inebriated destruction. His actions while drunk are usually a combination of misguided attempts to impress Guy, regardless of whether or not Guy is around, and he drunkenly attacks any friend or foe that is near him. His alcoholic lapses are relatively brief, and he has no memory of his actions once he has returned to his normal self.